Smiley Teddy chịu, gấu for Sylvie. Teddy chịu, gấu with a smiley for Sylvie :). 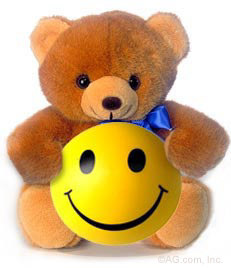 Wallpaper and background images in the luôn giữ nụ cười club tagged: smile teddy bear smiley happy friends sylvie. Awwww this is just gorgeous !!!! OH Karen ! What a lovely Teddy Bear ! He's so cute, so lovely ! My new partner for my nights ! And for the first time I can say I love your yellow smiley ! Like you Karen, but I must say (For Berni in particular) This Teddy will be my partner in night but NOT in a naughty way ! Never naughty with the teddy lol !!!!!!!!! OOf ! Because Ooops ! I thought I was do a great mistake with this sentence ! I bet you both wished i'd never joined this spot lol !!!! OMG Berni ! Why these words ? But I see your laugh, you don't trick me, I'm only allowed to trick you in quiz ! Yes you always trick me in quizzes lol ! !but not the Cary quiz you did for me lol !!! Sure I remember this ! I will look forward to that !! OK but surprised !! Shhhh... Secret ! Like you !! lol ! Fanpop is so messed up today, I can't see any images at all! Don't worry Karen, it's the same for me ! But good news for Chowder ! Vicky I wish bạn a beautiful purple ngày !